We had a great weekend here. Friday night we kept it low-key with Chinese takeout and Dateline since Ian needed to pack for his flight the next morning to Florida. He went to Gainesville to watch his ECU Pirates play the Gators. He came home with the most adorable alligator hairbow for Camille! It reminded me of when my Dad would go out of town and bring home a small treat for my sisters and me. So, Camille and I were on our own Saturday and half of Sunday! We had an awesome time, including a park playdate Saturday afternoon with Gigi and a bagel breakfast Sunday with Caroline and Thomas (you know their mama, Christina!). Time with friends is always a highlight of the day. I even let Camille stay up late (allllll the way until 7:30) so that we could watch the first fifteen minutes of the football game and search for "A-da" in the crowd. I sent him this photo letting him know that we were on the lookout. Camille LOVES the Dr. Praeger's spinach bites. My friend Kristen turned us on to them. They are $4.99 at Earthfare and Whole Foods (surprisingly enough, Harris Teeter has them at $5.99), but yesterday I was at Aldi and I spotted these in the low freezer sections. They weren't priced, so I asked the checkout lady, and they were $2.99 a box. I compared the box to the Dr. P's box we have in the freezer, and the ingredients are the exact same, to a tee. This is a prime example of why I love shopping at Aldi. It's not as glamorous as Whole Foods, but a lot of times it's the very same product for much less. 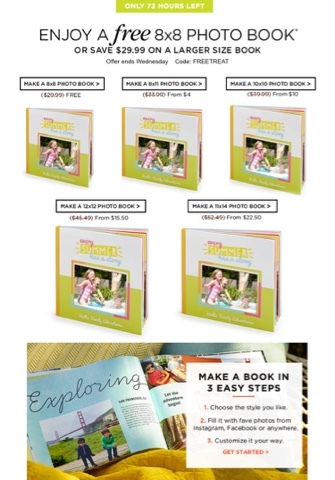 I wanted to share this deal that expires Wednesday for a free photobook from Shutterfly! The code is FREETREAT. I love getting emails from them with their freebies. You do pay shipping and tax, but it's still a great deal. If I can get my act together, I'd love to put together an 8x8 book of highlights of Camille's first year. In not-so-fun news, have been having some gnarly lower back pain recently. Last night it got so bad that it was making me involuntarily yelp when I leaned over to do simple tasks -- pick up an item from the floor, put a toy in the bathtub, you get the idea. Luckily Ian took over bathtime so I could relax with a heating pad on the couch. I have a 4:00 appointment today with a chiropractor who has come highly recommended by some girlfriends. I've never seen one before, but I am really hoping for some relief! It's time for us to get ready for storytime at the library and lunch with one of Camille's baby besties. I'll put some cute photos on Snapchat or Instagram if I can! (@alizadventures on both) Catch you tomorrow! Loved your cute snaps this weekend! I'm hell bent on starting the shutterfly book.....I wonder, do you think you have to finish the book in order to redeem the code....I'll have to check it out and report back! I really need to get to Aldi! I will be curious to hear if the chiropractor worked well for you. 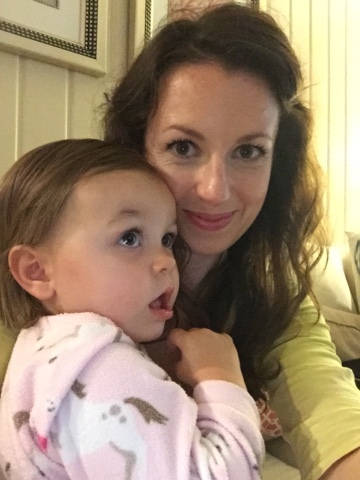 Carrying around my little toddler has caused me a lot of back pain lately and I have been wondering about whether a chiropractor would work! Love following along on snapchat! Hope your back feels better this afternoon! I really need to incorporate more dark greens into dinnertime I will have to check those out next time we are at WF. Ah! April I shop at Aldi too! I LOVE IT! 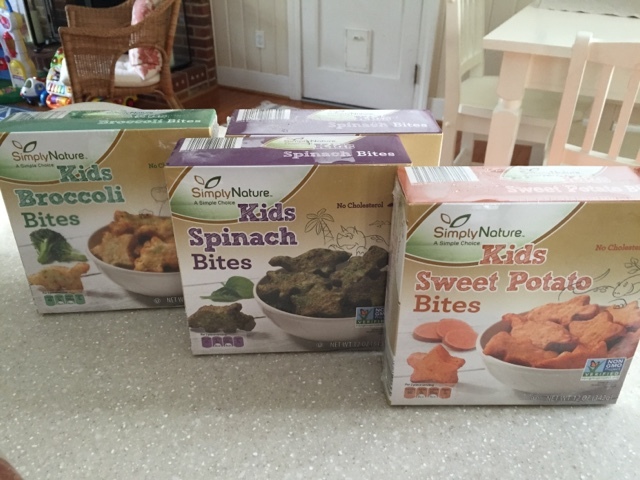 I have had the worst time coming up with good toddler meals. I will definitely be checking these bad boys out at Aldi! I will be checking into those bites asap. Caleb has gotten so picky over the last few months, so I am willing to try anything to get a bit more healthy vitamins and nutrients into him! Sounds like a great weekend! I'm trying to plan for being sans daddy this weekend too! I hope your back is feeling better! I pulled something in my neck & shoulder the other day - being down & out when a mom isn't exactly convenient! I had major back issues when my son was little. My Chiro was a HUGE help. They usually suggest ice over heat. Hope you get some relief asap!! I had neck issues earlier this year. I went to the chiro (I was totally skeptical) but it was worthwhile... and yes, ice over heat!! Keep The White Jeans In The Drawer!